Trade Mark East Africa. 2015. Business development through smallholders farmers in East Africa. GREAT Insights Magazine, Volume 4, Issue 5. August/September 2015. The teamwork involved in growing East Africa’s economies – from the government, to TMEA, to the private sector, to the producers, such as smallholder farmers – is vital for achieving their poverty reduction objectives. For Faustini, Jane and Japhet, it is already showing results: as their business competitiveness and incomes increase so too does their drive to continue the process. Faustini a father of 6, is a coffee farmer in Rwanda. He has been growing coffee for 20 years. He started with 200 trees he inherited from his father who was a traditional coffee smallholder. In 2005, at a time when a coffee drinking culture was rapidly expanding across the globe, the Musassa Coffee Co-operative was formed in Ruli District – located in Rwanda’s verdant hills, a slow and steep 2-hour drive from Kigali. The establishment of the cooperative represented a promise of access to markets and this encouraged Faustine to take coffee growing more seriously. He increased his trees to 1700 and over time hired extra help of 5 workers. Musassa Coffee Co-operative represents 2,000 smallholder coffee farmers, 60% of them women. The farmers take their beans to designated collection points in the district from where they are delivered to the washing station, for washing, drying and grading. Almost all Rwandan coffee is exported in the green (unroasted) state because the buyers prefer to roast it themselves, sometimes blending it with other coffee types from various origins. Faustini has done well over the 11 years he has been part of the Musassa co-operative. While his father lived in a house made of mud, Faustini’s is brick and has electricity. His 6 children are in full time education, and sometimes help on the farm when not in school. Faustini’s new-found prosperity may be proof that Rwanda’s plan to achieve middle-income status and a knowledge-based economy by 2020, is on track. Rwanda’s Economic Development and Poverty Reduction Strategy sets out the roadmap, in which the private sector takes the driving seat, assisted by the government as it reduces constraints to the growth of investment. 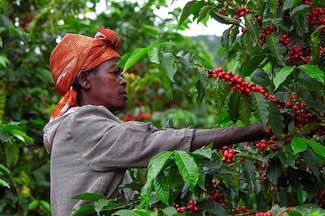 As part of its export strategy, Rwanda’s coffee sector has prioritised value addition activities such as roasting, grinding and packaging, launching the Rwandan Farmers Coffee Co-operative (RFCC) in March this year. With support from the National Agricultural Export Board and the Clinton Hunter Initiative, the RFCC invested in a state of the art processing machine that stores roasting ‘profiles’, ensuring consistent coffee in flavour, colour and texture. In addition, the RFCC has created its own up market coffee brand – Gorilla’s Coffee – using coffee from farmers like Faustini who can meet specific criteria. Financially it makes sense in that a container of processed, packaged coffee is worth 12 times the cost of a container of green coffee. The next step is to find a market. “Our sole aim is to retain as much value from the coffee chain as possible in Rwanda and for farmer coffee growers,” explains Eric Rukwaya the sales and marketing manager at RFCC. TradeMark East Africa (TMEA), working in Rwanda since 2011, supports Rwanda’s goals with expert advice and funding that facilitates trade, especially across borders. It is assisting with access to markets by seconding market linkages specialists who work with the Rwanda Development Board to match products with markets. Already they have found a niche market for Gorilla’s Coffee in Uganda, with a regular monthly order worth nearly US$2,000. In 1999, Jane Nazziwa moved from the capital city of Uganda, Kampala, to a small island 40km away, located amid the papyrus channels of Lake Victoria and accessible only by boat. Jane went there to look after her brother’s 7 young children who were AIDS orphans. Her brother had been a farmer on Bussi Island, growing crops on 7 acres of land. Arriving on Bussi, Jane knew nothing about farming and spent the first couple of years learning on the job. Then, thanks to a programme run by Jali Organic Development Company (Jali), a company processing organic pineapples for export, Jane learnt that by cooperating with other farmers, she could use economies of scale and the power of bulk selling, to increase her income. Jali is run by businessman Ephraim Muanga. Knowing that Uganda’s pineapples were renowned for their sweetness, he committed to buying pineapples from Bussi Island smallholders. The only problem was getting the pineapples to the market. Taking them by canoe to the mainland was a time consuming process and, because he was buying in bulk, not practical. Muanga connected with NOGAMU (National Organic Agricultural Movement of Uganda), an umbrella organisation of farmers, processors, exporters and others, with over a million smallholders in its network. NOGAMU’s main objective is to link growers with buyers. In doing so, it offers research and extension services, helps farmers to get appropriate export certification and advocates an enabling environment for farmers. NOGAMU also promotes organic agriculture, a sector currently worth about US$44 million annually to Uganda and still growing. NOGAMU helped the local farmers on Bussi to convert their farms to organic cultivation and then assisted them in getting export certification suitable for Japan, the USA and Europe. Meanwhile, NOGAMU introduced Jali to buyers from Japan who wanted to import dried pineapple slices for domestic use. Realising that dried pineapple slices were much lighter and easier to ship, Muanga built a small processing plant where pineapples are peeled, sliced, dried and packed, ready to export. The certification process, however, is expensive and so NOGAMU applied to the TradeMark East Africa Challenge Fund (TRAC) which was set up to promote innovative ideas to improve trade and to advocate for policy change to create a better farming environment. NOGAMU was one of 4 successful recipients of the first TRAC grants, which are issued in 5 instalments only after specific milestones have been reached. The benefits to the farmers are already apparent. Jane is one of Jali’s best suppliers and now employs 5 people to work on her farm. Since converting to organic farming and selling her produce to Jali, her life has changed for the better. She has rebuilt her brother’s old mud brick house with cement and has added rooms and a new roof. She is also able to educate those children still at school, including her own. While Jane was learning how to be a farmer on Bussi Island, 1,000km to the south, near Moshi in northern Tanzania, Japhet Kileo of Samaki Maini village, father of 3 children and carer for 5 others, was growing coffee on his smallholding but with diseased crops and a depressed coffee price, Japhet found it tough. Eventually he realised that his coffee crop was worthless and he stopped growing it, leaving him with an empty 1.5 acre plot. Then Japhet heard about Africado, a company cultivating avocados for export. He attended a talk given by James Parsons, a local farmer and CEO of Africado, where he learnt about the benefits of growing avocado trees: they are relatively easy to grow, produce an annual crop (with careful cultivation, sometimes 2 crops per year), attract few pests, last about 25 years and being trees, are good for the environment. Parsons promised to show the farmers how to plant their trees and through his field officers he would follow up on the growing process. He also committed to buying the avocados from the smallholders, which he would wash, dry, sort and pack for onward transport to the markets. Japhet was convinced of the benefits and in 2010 he bought 100 avocado tree seedlings from Africado at a subsidised price and planted them in his shamba (smallholding). Like NOGAMU, Africado is a recipient of TRAC funding, some of which contributed to the cost of the avocado packhouse where the fruit is processed for export. Parsons is also committed to getting all 1,950 smallholders currently in the scheme (he is aiming for 3,000 eventually), certified under Global Gap, an organisation that sets voluntary standards for the certification of agricultural products around the globe. It is a laborious, time consuming and expensive process but until farmers are certified they will not be able to export their produce. Japhet sold his first crop of 199kgs of avocados to Africado in 2013. He expects the crop to be even bigger this year, maybe up to 300kgs, if the weather is favourable. With the income he has bought more seedlings (he now has 165 trees, though the majority of farmers have less than 60) and paid for his children to attend school. TradeMark East Africa (TMEA) is funded by a range of development agencies with the aim of growing prosperity in East Africa through trade. It works closely with East African Community (EAC) institutions, national governments, the private sector and civil society organisations. This article is a compilation of TMEA Impact Stories Enriching Rwandan smallholder farmers as export markets expand, August 2015; and TMEA impact Stories Increasing business competitiveness through smallholder farmers in East Africa, August 2014. Photo: A Rwandan woman picks coffee beans. Credits: Borlaug Institute.